At first, it seemed like debris. Large objects were falling from the top of the World Trade Center's north tower, just a few minutes after American Airlines Flight 11 hit. "It took three or four to realize: They were people," says James Logozzo, who had gathered with co-workers in a Morgan Stanley boardroom on the 72nd floor of the south tower, just 120 feet away from the north tower. "Then this one woman fell." She fell closer to the south tower, he recalls. Logozzo saw her face. She had dark hair and olive skin, a white blouse and black skirt. She fell with her back to the ground, flat, staring up. "The look on her face was shock. She wasn't screaming. It was slow motion. When she hit, there was nothing left," Logozzo says. Logozzo cried, "Oh my God!" and raced for the stairs. When he got to the street 45 minutes later, he looked up. By then, his building had been struck by United Airlines Flight 175. From the ground, he saw two more people jump. This time, they were from his building. The story of the victims who jumped to their deaths is the most sensitive aspect of the Sept. 11 tragedy. Photographs of people falling to their deaths shocked the nation. Most newspapers and magazines ran only one or two photos, then published no more. USA TODAY ran one photo Nov. 16. Still, the images resonate. Many who survived or witnessed the attack say the sight of victims jumping is their most haunting memory of that day. It was worse than people realize. 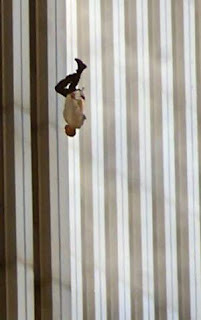 USA TODAY estimates that at least 200 people jumped to their deaths that morning, far more than can be seen in the photographs taken that morning. Nearly all were from the north tower, which was hit first and collapsed last. Fewer than a dozen were from the south tower. The jumping started shortly after the first jet hit at 8:46 a.m. People jumped continuously during the 102 minutes that the north tower stood. Two people jumped as the north tower began to fall at 10:28 a.m., witnesses said. For those who jumped, the fall lasted 10 seconds. They struck the ground at just less than 150 miles per hour — not fast enough to cause unconsciousness while falling, but fast enough to ensure instant death on impact. 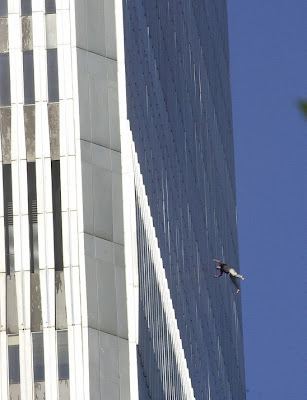 People jumped from all four sides of the north tower. They jumped alone, in pairs and in groups. Most came from the north tower's 101st to 105th floors, where the Cantor Fitzgerald bond firm had offices, and the 106th and 107th floors, where a conference was underway at the Windows on the World restaurant. Others leaped from the 93rd through 100th floor offices of Marsh & McLennan insurance company. Intense smoke and heat, rather than flames, pushed people into this horrific choice. Flight 11 struck the 94th through 98th floors of the north tower, shooting heat and smoke up elevator shafts and stairways in the center of the building. Within minutes, it would have been very difficult to breathe. That drove people to the windows 1,100 to 1,300 feet above ground. There were several reasons more people jumped from the north tower than from the south. The fire was more intense and compact in the north tower. The jet hit higher, so smoke was concentrated in 15 floors compared with 30 floors in the south tower, which was hit on the 78th through 84th floors. The north tower also stood longer: 102 minutes vs. 56 minutes. And twice as many people were trapped on the north tower's upper floors than in the south tower, where occupants had 161/2 minutes to evacuate before the second jet hit. The New York medical examiner's office says it does not classify the people who fell to their deaths on Sept. 11 as "jumpers." "A 'jumper' is somebody who goes to the office in the morning knowing that they will commit suicide," says Ellen Borakove, spokeswoman for the medical examiner's office. "These people were forced out by the smoke and flames or blown out." She says the medical examiner's office couldn't determine who jumped because the injuries were similar to those suffered by the people killed in the collapse of the towers. The manner of death for all those who died was listed as homicide on death certificates. 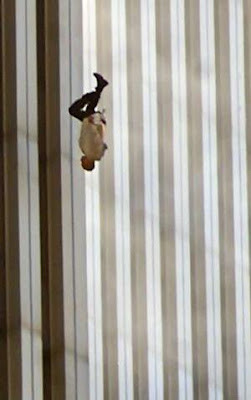 To make its estimate of the number of people who plunged from the Trade Center, USA TODAY reviewed videos and photographs, interviewed witnesses and analyzed the time and location of the jumping. The newspaper discussed its conclusion with officials in the fire department and medical examiner's office who, while not making calculations of their own, deemed an estimate of 200 jumpers as accurate. The New York Times counted 50 different jumpers in a review of photographs and videotapes. USA TODAY's estimate attempts to include people whose falls were not documented. Nearly all photos were of the north tower's north and east faces, which were more accessible to photographers coming from uptown Manhattan. But witnesses reported that numerous people leapt from the north tower's south and west sides as well. On the south side, firefighters reported 30 to 40 bodies on the roof of the 22-floor Marriott Hotel, adjacent to the north tower. On the west side, falling bodies crashed onto the awning covering the circular VIP driveway. The thudding of bodies at this entrance can be heard on a video taken near there by French cameraman Jules Naudet, whose footage was broadcast on CBS on March 11. On the east side, people plummeted into the plaza, best known for its globe sculpture. Blood covered the glass walls and revolving doors that led to the plaza from the second-floor mezzanine in the north tower. People evacuating the north tower walked by this horrible sight. "The windows were red ... and bits of bodies were outside. We were stunned and amazed," says Richard Moller, who escaped from the 78th floor. After the first jet crash, Port Authority police Officer David Lim took an escalator from the lobby of the north tower to the plaza level, one floor above. He saw a disfigured body near a stage where musical groups performed on the plaza. "I said, oh my God! I've got to call this in. 'I've got a DOA on the plaza.' The desk officer said, 'Are you sure he's dead?' As I'm retransmitting, another body falls." To be sure, some who fell didn't jump. Witnesses say a few people seemed to have stumbled out of broken windows obscured by smoke. But most say those jumping appeared to make a conscious choice to die by falling rather than from smoke, heat or fire. Ultimately, they were choosing not whether to die but how to die. Nobody survived on the floors from which people jumped. Victims who jumped had a profound influence on the evacuation. Firefighters moved their command post away from the building to avoid them. A falling body killed a firefighter. Fire Commissioner Thomas Van Essen, rushing out of the north tower to meet Mayor Rudy Giuliani, was nearly killed when a body landed 15 feet away. To safeguard people from falling bodies and debris, authorities blocked the main exits from the lobbies to the street. Instead, people escaping from both towers were sent through an underground shopping mall and under the outdoor plaza where bodies were falling. The sight of people jumping saved lives, too. In the south tower, people had a close-up view of people plunging to their deaths from a building that was a mirror image of their own. "I looked at a couple of people jumping, and that was it. I'd seen enough. I said, 'We've got to get the hell out of here,' " says Jaede Barg, who worked for Aon on the south tower's 100th floor. Many south tower survivors say the sight of people jumping created an urgency that caused them to leave immediately and ignore announcements that it was safe to return to their desks. About 1,400 people evacuated the upper floors before the second jet hit. Eric Thompson, who worked on the 77th floor of the south tower, went to a conference room window after the first jet hit. He was shocked when a man came to a north tower window and leapt from a few floors above the fire. Thompson looked the man in the face. He saw his tie flapping in the wind. He watched the man's body strike the pavement below. "There was no human resemblance whatsoever," Thompson says. Some say that those that jumped lacked courage. 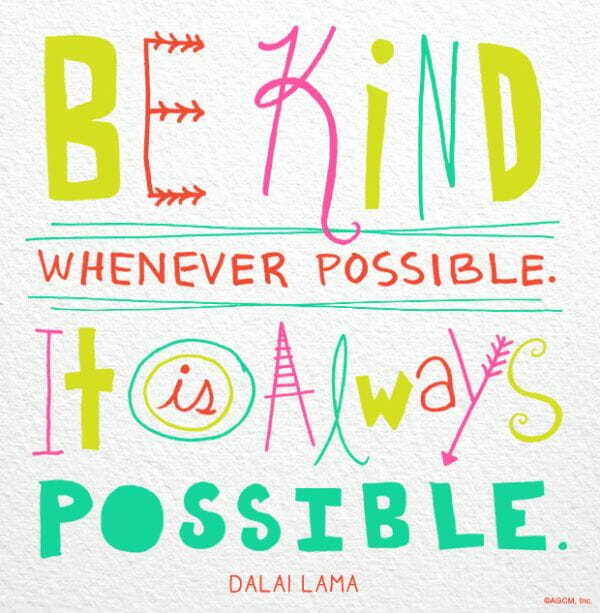 Shame on those so self-righteous. I think it took courage to fall to the Earth knowing this would be your last minutes. I believe it was brave to choose your own death. But what a choice it was, incineration from the jet fuel or destruction dozens of floors down. Bravery in the face of an evil choice...May they rest in peace.